Perfect amount of RAM and is even DDR4-2400! Only one stick though and doesn't have heat spreaders. Of course, I can always just add another stick and have 16 gigabytes and make sure I have plenty of air flow going to it. 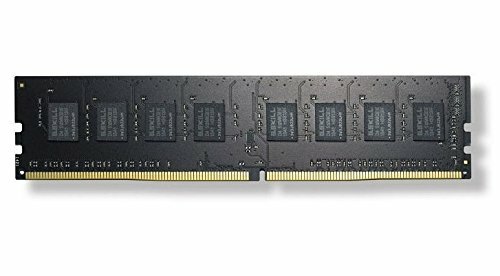 Great, cheap DDR4 RAM. Even though there's no heatsink, it looks very slick. And in this mini itx build nobody's going to see it anyways. Cheap RAM. Works well. I don't really know what to say. Ram is one of those parts you can easily cheap out on, because it is so easily replaceable. Don't like one? Pop it out and add a new one. Need more? Get another and pop it in. I really hate the pressure it takes to install ram, but that is not the ram's fault. Every ram I've used works that way. Cheap Ram, looks good even without a heat spreader. Its good looking, cheap and well performing. It works even doe its not officially supported by my motherboard. Great budget RAM, the black color looks great in my B+W build.